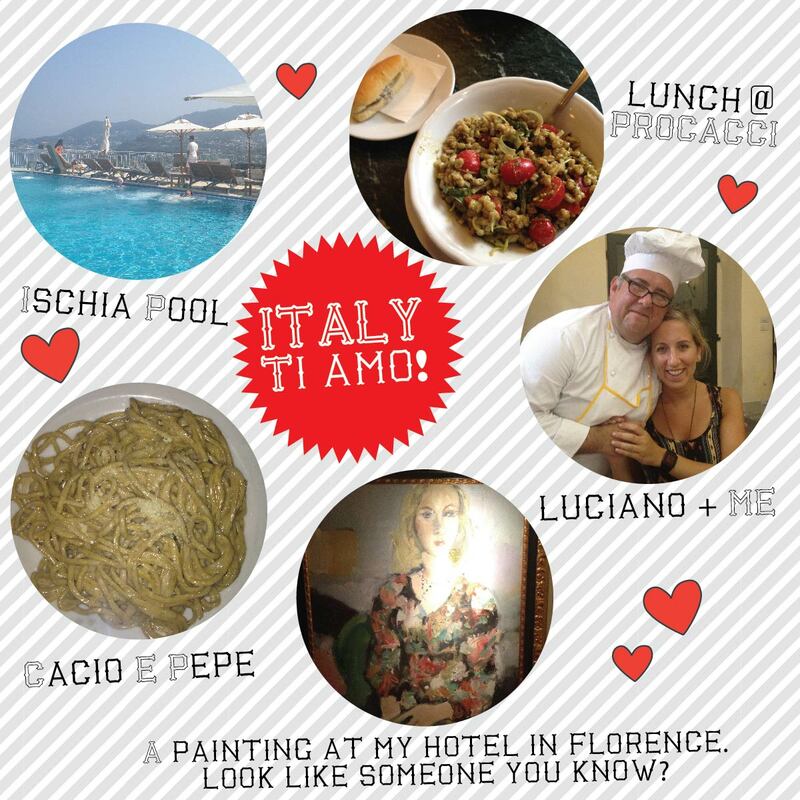 -Our trip began on the beautiful island of Ischia, where the views from the hotel pool make you want to cry out of pure joy! It was all about sitting by the pool and relaxing in Ischia, which I did not mind one bit! -I drove in Italy! Can you believe it? I wasn't originally supposed to, but due to a last minute change in plans, I stepped up to the plate. Luckily we made it from Ischia to Rome in one piece. This involved driving down a scary cliff (honking the horn every 5 seconds so the people driving up the "two way street" would hear me from around the corner), then onto a car ferry, and finally from Naples to Rome. They say if you can drive in NYC, you can drive anywhere (or did I make that up?). I guess it's true! -My first meal in Rome: Cacio e Pepe at Ulisse. I'm still dreaming about it 'til this day (and unsuccessfully trying to find one as good in New York)! Cacio e Pepe is just pasta with cheese and ground pepper. So simple, but delicious! -Salumeria Roscioli in Rome. The Burrata with Shrimp Ceviche & Bottarga: Out of this world! Also, ordered meats and cheeses galore. Cholesterol Schmolesterol! -Ahh, where do I begin about my cooking class at a Tuscan villa in Florence. Yes, you heard me right, "Tuscan Villa", sounds terrible, right? Our teacher Luciano was possible the most adorable man on earth, and full of knowledge! We cooked a five course meal, and by "cook" I mean, I started drinking red wine at 11am, and vaguely remember Luciano sautéing some garlic at one point in the day. Haha, just kidding. I actually did learn a lot. We made lasagna from scratch: I'm talking homemade pasta, tomato paste from fresh tomatoes...Amazing! At the end of the class, we all sat down and enjoyed our lovely home cooked meal. -Mmm a truffle sandwich and tomato farro salad at Procacci in Florence. Delizioso! -Venice! Oh Venice! One of the most amazing places I have ever been. Loved my Squid Ink Pasta with Clams & Zucchini Flowers at Al Covo. -Peach and Lavender gelato at Gelateria Del Teatro. I never thought I was a huge fan of gelato, but this was so refreshing and unlike anything I had tasted before. And the shop was tucked away in my favorite Roman neighborhood, Campo de Fiori. Cannot wait for my next journey to Europe, which happens to be in 8 days! I'm going on a work trip to Milan, London & Paris. So excited! Hope crossing the street in Milan is less scary than Rome, where there are no rules, and Vespas actually drive on the sidewalk too! Crazy madness! -Don't let slow-walkers frustrate you, and try to stifle your desire to take their phone (which is most likely causing them to walk slowly in the first place) and throw it down the street! Although how awesome would that be, seriously??? -Strive to set your Spotify to private session more regularly, no one needs to know you are listening to the Spice Girls in 2013! -Stop calling Siri mean names when she can't understand you (which is always! ), she means well! -Use less exclamation marks! You're the girl who cried enthusiasm! People can't tell what you're really excited about if every sentence ends with an exclamation mark! Ok, need to work on this one :) Oh, and use less emoticons, you're not 16 anymore! Not that emoticons even existed when you were 16. And stop talking about your age all the time! -Try not to get mad when people start crowding your gym as part of their new years resolution. I know, I know, you've been going all year round, but you need to get over it! Plus, it's never going to last anyway! -You're a grown woman, try not to obsess as much about your birthday, which is coming up in exactly 28 days, or 4 weeks...WOOOHOOO It's going to be the party of the year!!! I mean, whatever, it's just another day, stop obsessing about all the attention and presents (which are going to be amazing! Yay!). Still working on this one as you can see. But seriously, I think this is the one I'm going with: Stop trying to change who you are, you're PERFECT! Happy new year! 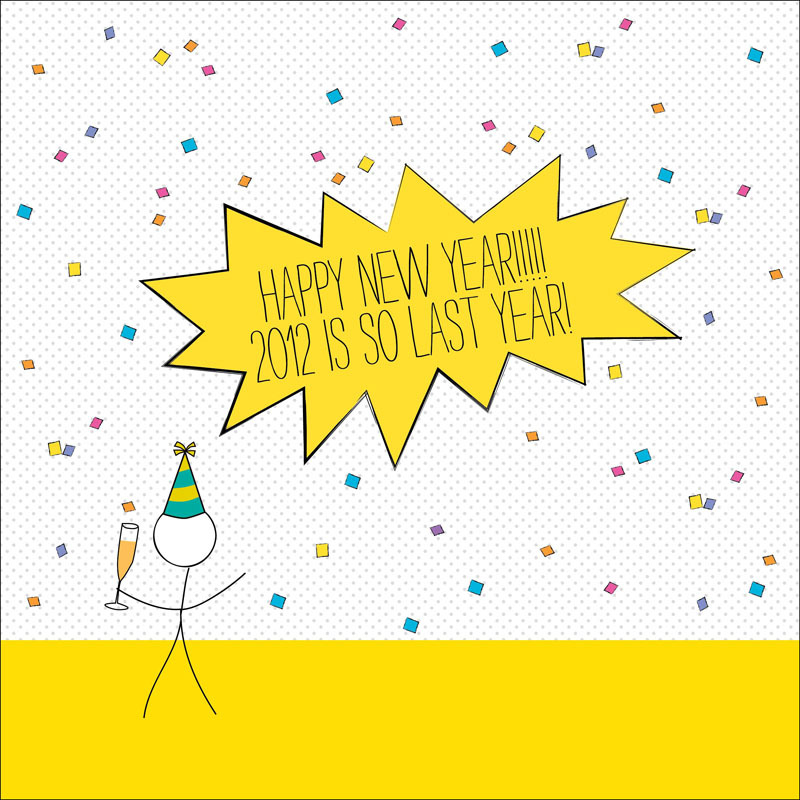 And really hope to blog more in 2013!! That's a New Year's resolution worth keeping!